Whenever there is a fire, the first and foremost thought that appears in one’s mind is to use water to douse it. Water mist systems are an improved way of how water is used to douse the fire. Water mist systems uses fine droplets to extinguish the fire by cooling it down. The cooling effect of water mist will be anywhere around 6 to 7 times than that of traditional water sprinkler systems. For any fire to occur the minimum ingredients are Oxygen, Heat and Fuel. It is also called the fire triangle. The removal of any of these three components will extinguish the fire. The water mist system extinguishes the fire by neutralizing heat and oxygen, hence it results in quicker firefighting. The efficiency of a water mist system in fire suppression depends on its spray properties, like droplet size distribution, flux density and spray dynamics, with respect to the fire scenario, such as the shielding of the fuel, fire size and ventilation conditions. Why use PYPLOK® in Water Mist Systems? PYPLOK® is a High Pressure Fitting which can take 6000 psi/415 bar upto 2” NPS. This is ideal for Water Mist System which is based on high pressures. No Nozzle clogging due to improper flushing, weld remnants and weld erosion. 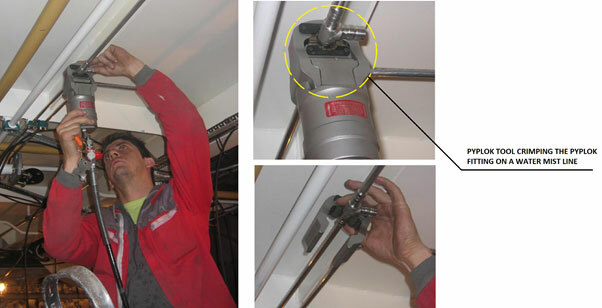 PYPLOK® has tailor made fittings for Water Mist System to decrease the number of joints/leaks. PYPLOK® has a huge portfolio of fittings from ¼” to 4” (6 to 115 mm) PYPLOK® is available in CS/SS/Cu-Ni/Duplex/Super Duplex. Hence the customer can be rest assured to be sourcing from one OEM (PYPLOK®) as opposed to many OEM’s in the case of fittings which have size & material limitations. PYPLOK® is type approved by DNV/ABS/LR/BV/Class NK/CCS/RMRS/KR which makes it versatile to be used in different industries and regions. PYPLOK® has a healthy list of past project installations which show its excellent usability in Water Mist Systems worldwide. Pyplok® has been used in water mist systems for City Halls, Museums, Genetic Labs, Libraries, heritage buildings, Motorway Tunnels, Underground Depot, Yachts, Cruise lines and many more.